What does the future hold? You can keep your Mayan prophecies and tarot cards; I'm sticking with Google. 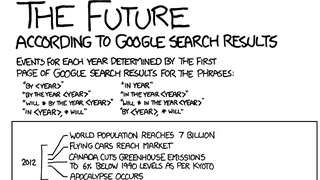 Thank you, xkcd, for showing us what will happen every year for the next 90. And sorry, Emperor penguin fans, for your loss in 2100.